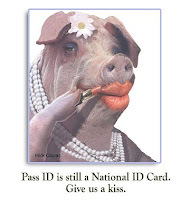 the Real ID Act once elected." As debates heat up for the final Presidential selection, the most controversial issue of Real IDs keeps bobbing up from the mire. The heated struggle between citizens, state's rights against federal mandates and the protection of the U.S. identity continues to be an issue. 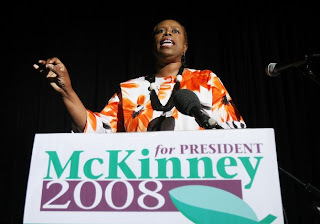 Many of you may have read BTC's previous President Select post featuring Cynthia McKinney. 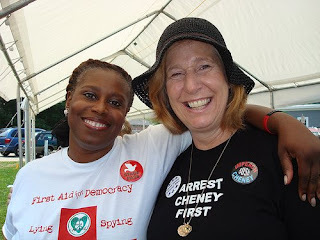 Cynthia McKinney : If elected to office I would take immediate steps to repeal The Real ID Act, the Patriot Act, the Secret Evidence Act, the Military Commissions Act, and all other pieces of legislation that are an affront to our bill of rights. In addition, I would use my executive power to void a great many of the 'signing statements' and authoritarian Executive Orders that have concentrated far too much power in the hands of the president. It is imperative to return POWER TO THE PEOPLE, which is my campaign theme. I would make public these power grabs and explain why a real democracy is incompatible with a 'unitary executive,' the Bush/Cheney philosophy. BTC: Do you have a plan to address DHS's role in The Real ID Act a power acting independently of the vote of the people? Such case would be the waiver of 36 federal laws based on Section 102 C of the Real ID Act to expedite the construction of the Border Wall fence. The Supreme Court refused to hear the case from The Sierra Club and Defenders of Wildlife. Cynthia McKinney: The border fence is a wasteful militarized approach to the issue of immigration. It's not the immigrants who are 'illegal'; what is illegal is the way U.S. economic policies treat workers in this country and throughout the world. Thousands who have been funneled into hostile terrain by the fence have perished in the past decade. I agree with the groups who initiated the lawsuit that Congress should not have delegated the power to waive federal, state and local laws regarding the construction of the fence to the Department of Homeland Security. BTC: How would you address Real Id's role in the plan for Continuity ofGovernment? Cynthia McKinney : The Real ID is a step toward implementation of a national ID that can then be expanded during a national emergency. We've already seen the violations of civil rights that occur after a disaster. After 9/11, over a thousand people, primarily from Middle Eastern, South Asian, and North African countries, were arrested and detained under harsh conditions without charges and denied access to legal counsel. During Hurricane Katrina, police fired their guns over the heads of hurricane survivors attempting to cross a bridge to safety in Gretna, Louisiana. By facilitating the establishment of a federal database of personal information with tremendous potential for misuse, the Real ID will further erode our civil liberties. The real ID is the precursor to a police state of the kind described in Orwell's 1984 and of the nature of state power exercised in Nazi Germany and the U.S.S.R. It is antithetical to democracy and must be vigorously opposed. CNET : The Department of Homeland Security has proposed extensive Real ID requirements restricting which state ID cards can be accepted at federal buildings and airports. Do you support those regulations as written, would you want to repeal Real ID, or would you prefer something in between? Evidently not. Senator Obama voted for $300,000 in Illinois State revenue to move Real ID implementations forward. His running mate, Joe Biden composed a legislative prototype for what would later become today's Real ID Act. However, when it came time to vote for or against Real ID - Biden was nowhere to be found. So which is it? Amendments to Real ID could increase National Security without hindering the personal civil liberties and the integrity of American citizenship. However, no amount of money can replace our privacy and identity security. Should healthcare, education, and rebuilding our country's infrastructure compete for funding with a corruptable identity database network costing taxpayers billions of dollars? It's time for Senator Obama to decide, before the Republicans decide for him. We are Anti-Real ID actvists and we approve this message. John McCain and Sarah Palin both live in states who have benefitted from the hard work of Anti-Real ID Activists in Alaska and Arizona. John McCain fully supports the implementation of Real IDs. His running mate Sarah Palin didn't lift a finger to support it or deny it. It didn't get her vote. Is this team strong enough to deny the identity securities we enjoy today without suffering through privacy exposures and hacking breaches in the Real ID data networks? Does John McCain know enough about Real ID to understand that his information goes in that database too? Can we afford to have a President whose judgement is so poor he would jeopardize National Security by entering his Social Security Number into an insecure license database? A database so insecure it can be hacked into from anywhere in the world? Our top officials personal information could possibly be seized by...anyone... even radical fundamentalist terrorists. He had better think over Real ID again. Real ID as currently written jeopardizes your personal security and our national security. 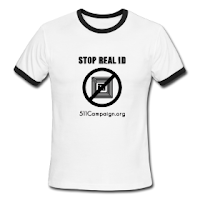 We are Anti- Real ID activists and we approve this message. When I return look for more information on companion blogs on Aaron Russo's Restore The Republic with Freedom.tv . I am leaving you a digest of material covering the coming faces of Real ID - Smart Cards & TWIC cards, Real ID's costs to states, and the lovely salty idealism coming from the great city of Austin, TX home to both director Richard Linklater and Alex Jones whose work you can see here, from the film Waking Life. There is a national push for Americans to volunarily adopt Smart Cards and TWIC cards to stay employed and for convenience. This is the incrumental compliance that has America in a sleeper hold right now. Beginning Oct. 1, The Florida Department of Highway Safety and Motor Vehicles will enforce new identification requirements in an effort to enhance security for drivers. Driver license applicants will be required to provide proof of a Social Security number. Palin essentially voted "present" this year when she allowed a bill to become law without her signature. Senate Bill 202 prohibits the state from spending any money to implement provisions of the federally mandated Real ID program. Rather than take a position on the controversial Real ID program in Alaska, the governor voted "present" and let the bill take effect without her signature. The Bush Administration and civil liberties groups are fighting over the fate of a frozen appeals court decision in the warrantless wiretapping legal battle, even as the government has yet to use its new powers to have cases dismissed with a mere letter to the judge from the Attorney General. "The Smart Card Alliance is a not-for-profit, multi-industry association working to stimulate the understanding, adoption, use and widespread application of smart card technology." What affect will the new administration have on the widespread adoption of government smart card identity and security initiatives currently underway? The 7th Annual Smart Cards in Government Conference will look at the industry challenged with meeting a new administration's timetable and market demands, as well as what lies ahead for government issuers, accreditation and testing authorities, and procurement programs. "This event is where colleagues will gather to look ahead to the next four years, share first-hand experiences and gain a thorough understanding of best practices and technologies available to help them achieve theirprogram goals," said Randy Vanderhoof, executive director of the Smart Card Alliance, the conference organizer. It will be held October 22 - 24, 2008 at the Ronald Reagan Building and International Trade Center in downtownWashington, D.C. Register for the conference by visiting the Smart Cards in Government Web site. -- Karen Evans, administrator of e-government and IT, Office of Management and Budget (OMB), on "Homeland Security Presidential Directive (HSPD) 12 - Four Years Later"-- Kathleen Kraninger, director, Office of Screening Coordination, Department of Homeland Security, on "Developing a Comprehensive Border and Travel Security Policy"-- Craig Wilson, H.R. 1 coordinator, National Preparedness Directorate/National Capital Region Coordination, FEMA, on "Why State First Responders Need Standard Credentials"-- Bob Gilson, program management analyst, Defense Manpower Data Center (DMDC), on "Defining Future Interoperability and Federation for CAC"-- Paul Hunter, Department of Homeland Security, on "Passport Card at Land and Sea Border Crossings"-- William MacGregor, Personal Identity Verification (PIV) card program manager, National Institute of Standards and Technology (NIST), on "Strategic Direction for NIST ID Card Standards and Special Publications"-- Judith Spencer, chair, federal identity credentialing, Office of Governmentwide Policy, General Services Administration, on "Crossing the Identity Divide: Trusting Commercial Credentials in the Federal Enterprise"
The conference program includes further discussion on all of the majorgovernment identity initiatives underway, including the HSPD 12 implementation of PIV cards for federal andcontract employee, electronic passports, REAL ID Act driver's licensereform, Western Hemisphere Travel Initiative (WHTI) passport cards, theTransportation Worker Identification Credential (TWIC) program involvingthe U.S. Coast Guard, registered traveler cards coming to dozens ofairports, and the first responder authentication credential pilots thatinvolve federal, state, and local agencies throughout the country.